On Nov. 16, Gov. John Bel Edwards and Wanhua Chemical Group Co. Ltd. executive Weiqi Hua announced the company will develop a $1.25 billion chemical manufacturing complex in the St. James Parish community of Convent, La. The 250-acre manufacturing site will be developed at the northwest corner of the intersection of Louisiana Highways 3125 and 3214, on the east bank of the Mississippi River with deep-draft river access and available rail service. The project will create 170 new direct jobs with an average annual salary of more than $80,000, plus benefits. Louisiana Economic Development estimates the project will result in additional 1,060 new indirect jobs, for a total of 1,230 new permanent jobs in the state. Wanhua will leverage its $1.25 billion capital investment to produce MDI, or methylene diphenyl diisocyanate. MDI is commonly used for polyurethane automotive parts, foams and elastomers, with applications in such consumer areas as appliances, electronics, spray-foam insulation, furniture, textiles and footwear. "Our LED team, joining other state agencies and regional and local partners, has worked diligently with Wanhua to attract this next-generation MDI project," Edwards said. "Louisiana offers world-class manufacturing sites, the most productive manufacturing workforce in the U.S., and LED FastStart, the nation's top state workforce training program. Our infrastructure assets enable us to compete for the leading economic development projects in the world. We welcome Wanhua to Louisiana and look forward to the company's contribution to our workforce and economy." In April 2017, Edwards and Wanhua Chairman and CEO Zengtai Liao announced Wanhua's decision to build the project in Louisiana. The choice of the St. James Parish site followed additional front-end engineering and development and final site selection activities. Wanhua plans to start construction in 2019, with the project generating 1,000 construction jobs at peak activity. The company anticipates construction will be substantially complete by the end of 2021. "Louisiana, and specifically St. James Parish, provides Wanhua with everything we were looking for," said CEO Weiqi Hua of Wanhua Chemical U.S. Operations LLC. Hua also serves as executive vice president and chief technology officer of parent firm Wanhua Chemical Group. "More than anything, successful operations are about people, and we know that Louisiana's workforce is among the most productive in the world. Wanhua looks forward to being part of the Louisiana business community and the local community. Our desire to be a good industry neighbor will be evident in our focus on workforce development, local hiring, and our commitment to safe and environmentally responsible operations. Our employees will be fully engaged in the local community and we will communicate regularly and openly." 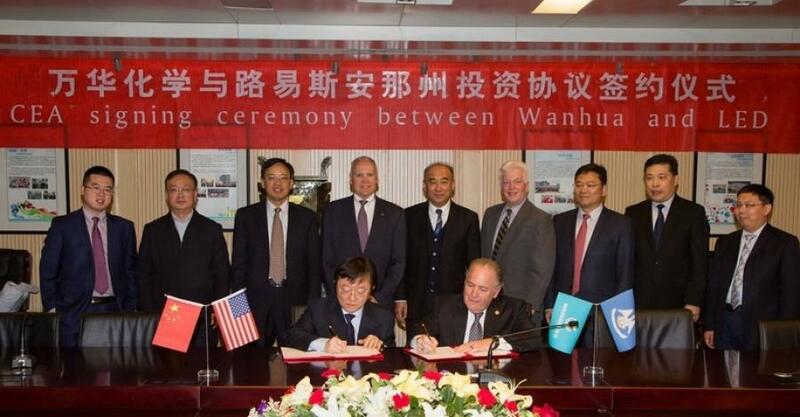 In early 2017, LED Secretary Don Pierson led a Louisiana contingent to Wanhua Chemical's global headquarters in China, where he, Liao and other officials completed plans to move the project forward. The company's investment will add to a Louisiana chemical industry that generates $80 billion in annual sales, supports more than 267,000 direct and indirect jobs, and benefits from an extensive infrastructure of ports, pipelines, rail and interstate highways. "Our great integration with existing petrochemical producers and pipelines, and our outstanding universities all play a part in positioning Louisiana as a next-generation leader in the chemical industry," Pierson said. "Louisiana has leveraged our strengths to capture billions in new investment. We continue to work hard every day to create a business climate and quality of life that are second to none." To secure Wanhua's investment, the state of Louisiana offered the company a competitive incentive package that includes the comprehensive workforce solutions of LED FastStart, the No. 1 state workforce training program for the past nine years in a row. The state also offered the company a performance-based grant of $4.3 million to offset site infrastructure costs, and Wanhua is expected to use Louisiana's Quality Jobs and Industrial Tax Exemption programs. "This $1.25 billion investment will generate economic growth in our community in the form of high-paying job opportunities for local residents and procurement opportunities for local, small businesses," said St. James Parish President Timmy Roussel. "I, along with the taxing authorities of St. James Parish, while following our land-use plan, want to see Wanhua become successful in St. James Parish, delivering new benefits to our residents. St. James Parish government works together with community, business, industry, and agriculture to provide resources and services to improve quality of life. We want our St. James Parish industries to continue to be a large part of our community, because St. James Parish is a great place to live, work, play and grow." Wanhua is a publicly traded corporation listed on the Shanghai Stock Exchange. Wanhua boosted its presence in the United States by establishing a business development office in the greater Philadelphia area in 2006. That office generates approximately $500 million in annual revenue. Wanhua established its U.S. headquarters in Houston in 2014, with additional research and development offices opening a year later. The company established its manufacturing entity — Wanhua Chemical U.S. Operations LLC — in Louisiana in 2016. The company's U.S. subsidiaries employ more than 60 in Louisiana, Texas and Pennsylvania. The Louisiana project represents Wanhua's commitment to bring manufacturing to the United States and to enable the company to better serve customers in the Americas. The Louisiana facility will be a major component of Wanhua's global development of MDI. In addition to China, Wanhua maintains major manufacturing operations in Hungary. "The Port of South Louisiana welcomes Wanhua into our port, and we look forward to assisting them in any way we can," said Executive Director Paul Aucoin of the Port of South Louisiana. "We look forward to a long and prosperous relationship."